IGNIS Innovation, established in Canada in 2000, specializes in providing technologies in the areas of pixel circuits and driver packages for AMOLED displays. IGNIS focuses on developing AMOLED backplane solutions using industry standard amorphous silicon (with compensation) polysilicon or other TFT technologies. They also develop specialized driver electronics and related OLED IP. Towards the end of 2013, Ignis started shipping 55” AMOLED MaxLife prototype samples to potential clients. Ignis is developing AMOLED panels based on LTPS backplanes in collaboration with China's CSoT. In May 2015, IGNIS raised $14 million. In June 2016 LGD signed a license agreement with Ignis to use its technology in LG's OLED displays. IGNIS Innovation announced that in collaboration with its partners, the company developed a driver chip that incorporates the ability to sense individual pixels on the panel. This new ability integrates into IGNIS' overall external compensation process and can improve the perofrmance and lifetime of AMOLED displays. IGNIS says that this new IC is already being used on medium sized panels designed for IT and automobile applications. IGNIS Innovation announced that it has signed a non-exclusive patent license agreement with LG Display. Ignis will provide LGD with access to its circuit technology to enhance the performance of OLED displays. Ignis Innovation developed several OLED circuit technologies. It's basic technology involves OLED compensation, both external and internal - which can improve the power consumption and lifetime of OLED displays. The technology should also increase production yields and enhance the picture uniformity and stability. IGNIS Innovation has secured $14 million in a new financing round. Ignis will use the new funds to accelerate product development especially the recently announced True Vision Display technology. True Vision Displays use the company's compensation technologies which extend OLED display lifetime and efficiency, and also enable HDR - even on mobile displays. Ignis further said that is working with partners to develop True Vision Display OLEDs for the wearable, smartphone, automotive, tablet and TV markets. Ignis expects the first products to launch next year. IGNIS Innovation announced that they have developed the world's first HDR mobile display. The so-called True Vision Display features a high contrast ratio, high frame rate, wide color gamut and high color precision and bit-depth. It's also very bright as required for HDR. Ignis will unveil their new display at SID's DisplayWeek 2015 next month, so we'll get more details. In the meantime, Ignis told us that this is a 5.5" HD AMOLED display that is extremely bright indeed at 1,500 nits (the Galaxy S6, for example, has a maximum brightness of 784 nits). IGNIS Innovation announced today that they are going to collaborate with Shenzhen China Star Optoelectronics Technology (CSOT) to develop a 5.5" HD AMOLED panel that will use Ignis's MaxLife Lite driving scheme. The AMOLED panel will be produced by CSOT using an LTPS backplane. Ignis's MaxLife Lite will enable high yields, low cost, low-power consumption, and long life time. CSOT hopes that Ignis' technology will enable them to quickly ramp up production. A couple of months ago Ignis Innovation announced that they began producing some 55" OLED TV evaluation samples for display makers to test their MaxLife compensation technology. Now the company finally started shipping orders to customers (display makers and OEMs). Ignis hopes that display makers will adopt their technology for TV, mobile and tablet OLED displays. According to IGNIS, this panel offers the world's lowest power consumption (20% lower than LG and Samsung's current OLED TVs), longest lifetime (a significant boost over existing OLED panels) and their technology can improve production yield and so lower production costs. Taiwan has a large display industry, but in recent years it seems that it is lagging behind Korea, Japan and China in AMOLED technologies. We asked a local industry expert to check out the three main Taiwanese AMOLED companies (AUO, Innolux and RiTDisplay), and now we post on his updates. As we reported already, AUO started producing AMOLEDs in their 4.5-Gen fab in Singapore after years of delays. According to our source, AUO is actually only producing samples. Those 5" 720p (295 ppi) panel samples have been been submitted to a company based in China. Earlier reports suggested AUO is going to supply HTC and Sony but it appears these two companies will keep using LCDs for now. 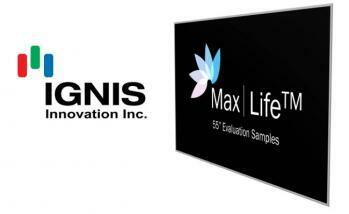 Last month Ignis Innovation announced that they began producing some 55" OLED TV evaluation samples for display makers to test their MaxLife compensation technology. The company now tells us that the first sample panel arrived at their offices, and they will start fulfilling orders (to display makers and OEMs) in about two weeks. 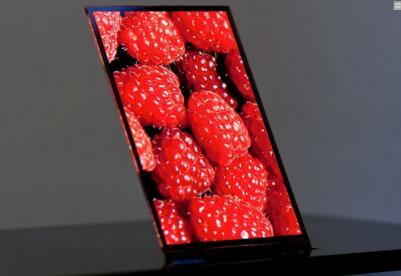 The company did some initial measurements, and they say that this panel offers the world's lowest power consumption (20% lower than LG and Samsung's current OLED TVs), longest lifetime (a significant boost over existing OLED panels). The panels are highly uniform (much better than the OLED TVs no the market). In May 2013, Ignis Innovation announced that it will soon start shipping sample 20" AMOLED displays to display makers to evaluation their MaxLife compensation technology. Today Ignis announced that they decided to go for a larger 55" FHD OLED TV. The company said it received "firm orders" for those samples from display manufacturers and OEMs. The MaxLife external compensation technology continuously measures every pixel in the display and compensates for even the smallest shift in performance (due to burn-in or bad manufacturing issues), making it completely uniform and completely stable. MaxLife can work with a-Si, LTPS and metal-oxide backplanes (those 55" panels now in production use a metal-oxide backplane). The technology should, according to Ignis, allow for cheaper OLED TVs as it improves yield and also enables simpler device (i.e. a simpler pixel structure with less TFTs per pixel). 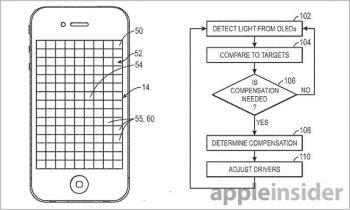 The US PTO published a new patent from Apple (filed in 2012) that describes how to use sensors to compensate for ambient lighting (see DisplayMate's related recent article) and lifetime brightness degradation in OLED displays. The patent describes that photo-diodes can be placed inside the OLED array or above and below it. Putting photo-diodes inside the display will enable them to more accurately measure light levels. So if a part of the screen is dimmer than the rest of the screen (for example because only a part of the display is under direct light) - the photodiode will detect it and then the display brightness in that area can be increased. This is something that cannot be achieved with a single sensor. Those photodiodes can also be used to learn whether certain OLED pixels (or pixel groups) have lowered brightness due to aging. Then the display can compensate and drive these pixels higher.